Anyone interested in participating in the church music program is invited and welcomed to attend choir rehearsals. 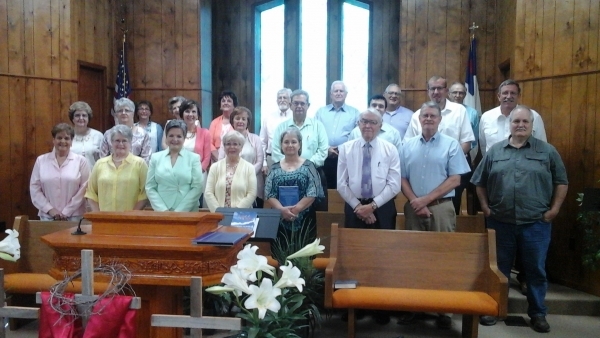 The Choir meets at 5:00 p.m. each Sunday afternoon in the church sanctuary. THE APRIL, 2017 VERSION OF THE ADULT CHOIR. Picture was taken Easter Sunday, April 16. Their presentation of “O What A Savior” was well received, and was a channel of rich blessings to the capacity crowd worship audience. Without your willingness to serve we would be unable to have special music in each of our services. It take dedication, love of the Lord, much praying, time and effort to do this. -If you cannot attend on your assigned date either trade dates with someone or contact Ronny Archer. NOTE: Kenneth Hendricks is the stand-by if needed at the last minute. We appreciate his willingness to be prepared to do this!! !